The General Data Protection Regulation is only five months away from being enforced. Naturally, more and more questions arise from the part of the companies that process data in the EU or receive data from the EU through cross-border transfer. 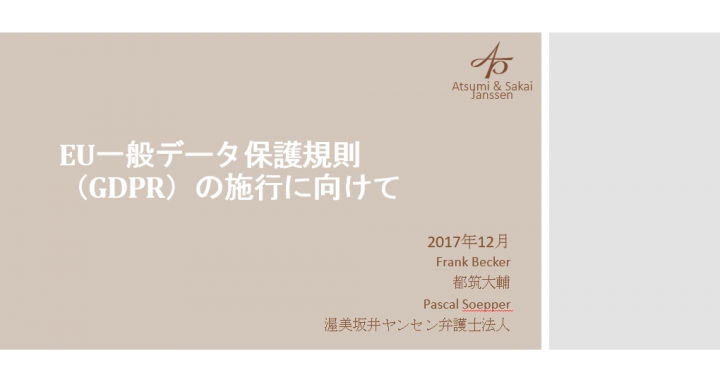 Atsumi Sakai Janssen’s team has timely responded to its Japanese clients queries on the new EU General Data Protection Regulation by organizing two insightful seminars on December 12 and 14, 2017 in Frankfurt am Main. 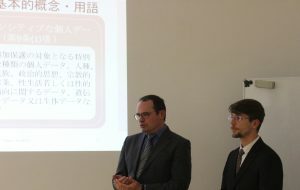 Member lawyers, Mr. Becker, Tsuzuki and Soepper, lead the seminar in Japanese language in front of dozens of representatives from the Japanese companies based in Rhein/Main region. Atsumi Sakai Janssen team explained changes in data protection that will be brought about by the GDPR. During the two-hour seminar lawyers offered explanations on general legal implications and suggestions on assuring compliance. The team has equally discussed some of the possible cases that may take place after the enforcement of the GDPR. 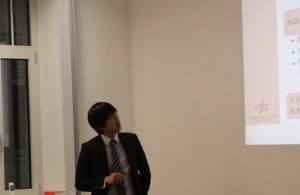 Other specifics were discussed further during the Q&A session. Each seminar was followed by a friendly get-together. During the event Japanese companies’ representatives took the opportunity to acquaint with their colleagues and exchange their business cards.